Parents, grandparents, guardians, alumni, and friends are always welcome to volunteer at St. Andrew’s Episcopal School. Each and every day you will see parent volunteers on campus assisting in various activities from shelving books in the library, to assisting with a mailing, to greeting prospective families at an Open House, to helping with classroom activities. 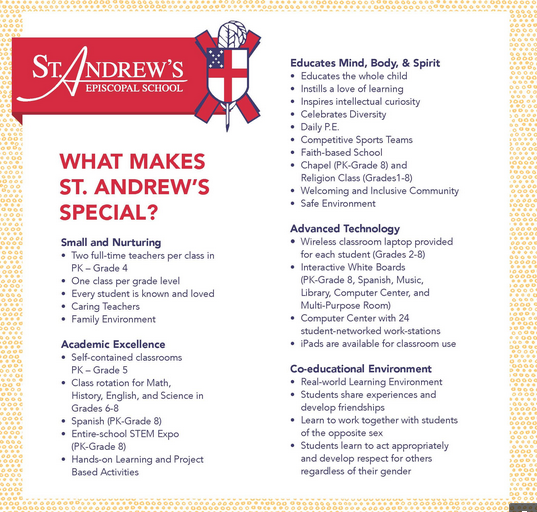 Parents are an integral part of life at St. Andrew’s Episcopal School. To volunteer, please contact the Office at (504) 861-3743 or contact a Parents’ Club Officer.